Drug International Limited Job Circular 2018 has been published by the authority. Drug International Limited is one of the most important company. 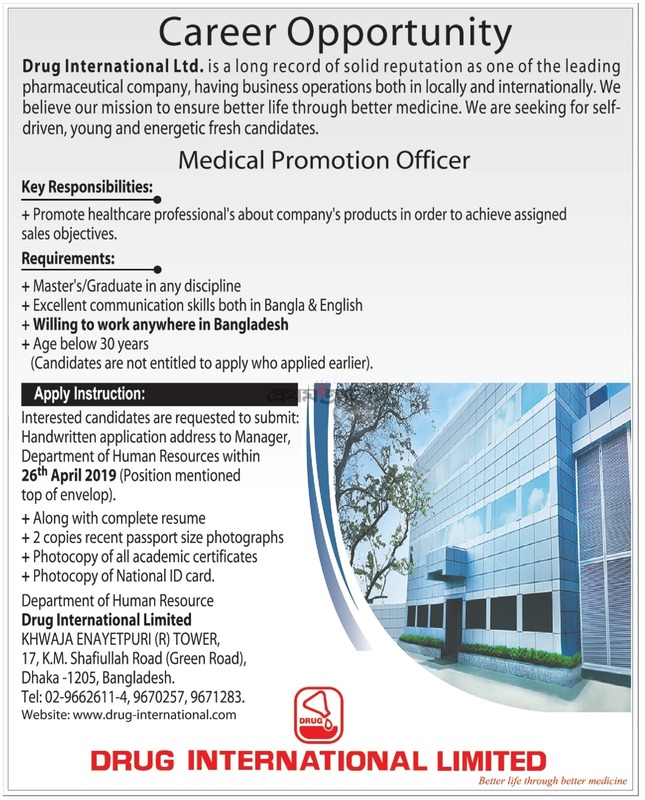 Drug International Limited published an attractive job circular. Anyone can take this opportunity. This job circular is too much important for the unemployed people. Drug International Limited is first company to produce Soft Gelatin Capsule (Vaginal Suppository) for antibacterial, bactericidal and antifungal action under the brand name of GYNOMIX.Since its inception the company has followed Patient Centric drug formulation principles; striving to improve quality of life of the patients.It is formulating drugs for all age group and gender, in different dosage forms like capsules, tablet, syrups, suspensions, injectibles, soft gelatin, suppository, cream, ointment etc. DIL maintains two principles of unique supply chain management by formulating medicines of optimized versions for specific patient group, and adopting policies of immediate release in market just after production. These two policies benefit the patients and pharmacies most as the medicine delivery system extends the product’s lifecycle.Drug International Limited has turned into a business conglomerate by establishing several companies in cross industry and verticals like in Information Technology, Ceramics, Textiles, Tea, Education, Healthcare and a separate Herbal Medicine Company by the name of Drug International Herbal Ltd.